HB228 • Goes to the full House for consideration. Al Hartmann | The Salt Lake Tribune Melva Sine with the Utah Restaurant Association describes the problems restaurants have complying with so-called "Zion Curtain" that requires restaurants that serve alcohol to pour and mix drinks out of view of customers. Rep. Ryan Wilcox, R-Ogden, listens at left. He presented HB228S1 to The House Revenue and Taxation Committee Wednesday February 27 which would do away with the "Zion Curtain" rule in restaurants. 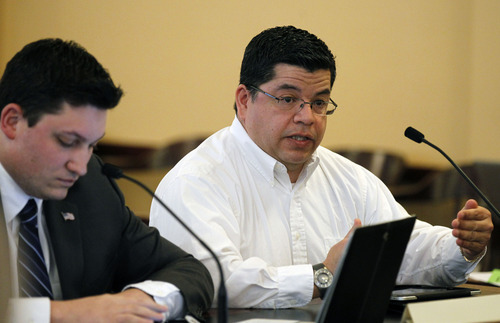 Al Hartmann | The Salt Lake Tribune Rep. Ryan Wilcox, R-Ogden, left, sponosr of HB228S1, listens as Ogden family restaurant owner Alex Montanez describes the hassles of complying with the so-called "zion curtain" that requires restaurants that serve alcohol to pour and mix drinks out of view of customers. It passed out of the committee. Al Hartmann | The Salt Lake Tribune Blake Ballard a small restaurant owner in Provo, and non-drinker describes the hassle he has complying with so-called "Zion Curtain" that requires restaurants that serve alcohol to pour and mix drinks out of view of customers. He said that the small area he pours drinks is the size of the desk in front of him and also used as his office. Rep. Ryan Wilcox, R-Ogden, listens at right. 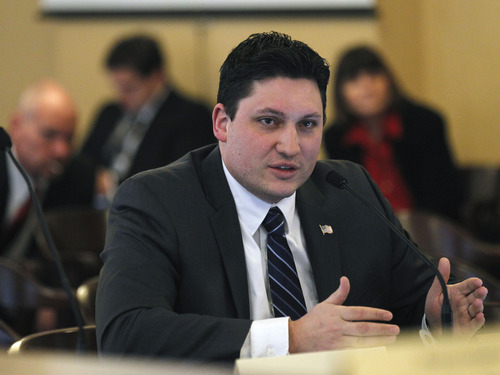 He presented HB228S1 to The House Revenue and Taxation Committee Wednesday February 27 which would do away with the "Zion Curtain" rule in restaurants. Paul Fraughton | The Salt Lake Tribune Mohsen Asgari (center) smashes the frosted glass curtain from his bar at Vuda Bar and Winery in Draper on Aug. 26, 2011. The barrier was torn down when the establishment got a bar permit, which unlike restaurants, does not require barriers to hide bartenders from public view. 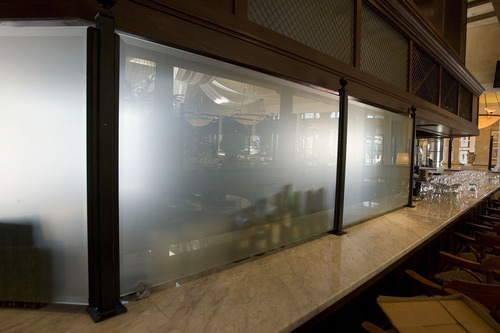 Paul Fraughton | The Salt Lake Tribune Conforming to Utah's most current liquor laws, a frosted glass curtain hides a portion of the bar at Brio Tuscan Grille at Fashion Place Mall. 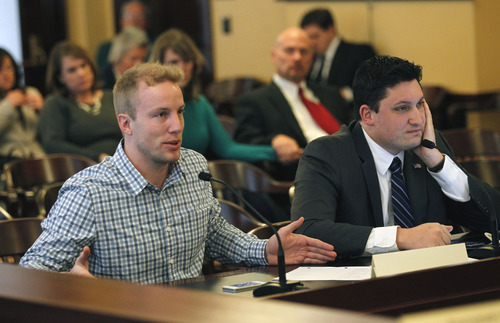 Al Hartmann | The Salt Lake Tribune Rep. Ryan Wilcox, R-Ogden presents HB228S1 to The House Revenue and Taxation Committee Wednesday February 27 which would do away with the so-called "zion curtain" that requires restaurants that serve alcohol to pour and mix drinks out of view of customers. It passed out of the committee. Restaurant barriers known as Zion curtains that shield bartenders and open bottles of liquor from public view could be torn down under a bill proposed by Rep. Ryan Wilcox, R-Ogden. On Wednesday, HB228 was approved on a 9 to 3 vote by the House Revenue and Taxation Committee. Lawmakers passed legislation in 2010 requiring restaurant barriers on the theory that shielding bartenders from public view would cut down on underage drinking, said Wilcox. "But there is no evidence to support that theory," he said. Rep. Earl Tanner, R-West Jordan, pointed out dangers alcohol poses to developing brains, and added that Zion curtains may be inconvenient and ugly, but "we need to do everything we can to keep kids from drinking." But Melva Sine, president of the Utah Restaurant Association, said eateries sell only 3 percent of the alcohol consumed in the state, the majority of which reaches customers through state-run liquor stores . She also said the barriers are an operational nightmare, and give an unfair advantage to eateries that opened before 2010, exempting them from the mandate. At Rovali&apos;s, an Italian restaurant in Ogden that opened in 2010, waiters pour soda and syrup into glasses of ice  then they must hide behind a wall to add the wine to the spritzers, said owner Alex Montanez. "The space is so narrow only one person at a time can go behind the wall," he said. And to ensure that state regulations are met so that diners cannot see behind the barrier, "we had to put up a fake olive tree, which makes it even more tight." Blake Ballard, owner of Spark restaurant in Provo, said tourists become uncomfortable when servers disappear into a converted coat closet that also doubles as an office to prepare beverages out of view. When drinks are mixed "in secret rooms," he said, "They wonder, &apos;What did you do to my drink?&apos; "
With House committee approval, HB228 now goes before the full House for consideration. The measure, however, is likely to face opposition in the Republican-dominated Legislature, where leaders often voice concerns about drunk driving and underage drinking. 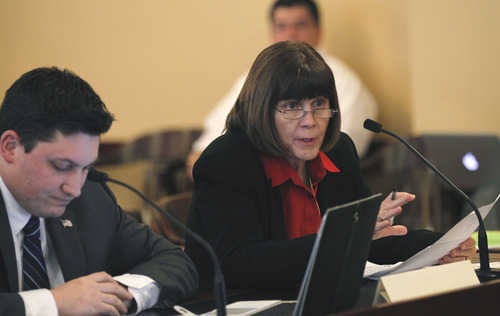 A majority of Utah legislators also belong to The Church of Jesus Christ of Latter-day Saints, which teaches its members to abstain from alcohol. House Speaker Becky Lockhart, R-Provo, said the bill stands a ``very good&apos;&apos; chance of passage in the House. She called Zion curtains "weird," and said she does not understand the argument that allowing youth to see the mixing of drinks would somehow make them more inclined to imbibe. But that&apos;s just the objection by some on the other side of the Capitol. Sen. John Valentine, R-Orem, who has taken the lead on liquor issues over the last several years, said Wilcox&apos;s bill would "make all our restaurants into bars," and said studies show exposure to alcohol leads to more youth drinking. He said senators he has talked to believe that requiring drinks to be prepared in a separate area is a good policy. "I don&apos;t believe it will pass in its current form in the Senate," Valentine said. Zion curtains have long been a part of Utah restaurants  coming down only briefly in 2009 when lawmakers did away with partitions in existing restaurants. The barriers, however, went back up again in 2010 as part of a compromise after lawmakers lifted a mandate requiring bars to operate as members-only social clubs. Existing restaurants were exempt  except in situations where they move to another location. The brief period when Zion curtains were torn down came about because earlier statutes were so convoluted that liquor commissioners overseeing the Utah Department of Alcoholic Beverage Control said the laws had become impossible to enforce. Part of the problem was that the barriers at that time were small, often built atop restaurant counters, resulting in confusing regulations. For instance, bartenders were forbidden to hand anything over the counter-top barriers  including a glass of water, a plate of food, a napkin or even a bill. Either the bartender had to walk around the counter or hand the items to a server who made the trek around the barrier. Lawmakers did away with the confusion by requiring restaurants to mix drinks in back rooms or erect barriers so large that the cordoned-off area was completely out of public view. That requirement meant that Montage Deer Valley, for example, was able to get a liquor license in 2010 only after assurances that the Park City resort would have enough barriers so that diners at one of its restaurants would not see a bar in an adjoining room. The question with the Montage was its dining room, which was adjacent to a bar. Compliance officers said diners in the far corner of the Montage restaurant could see into the adjoining club, even though columns obstructed most of the view, and the bar itself was about 300 feet away from the restaurant. The resort, in turn, installed planters to further obstruct the view. In other action Wednesday, the House Business and Labor Committee unanimously approved legislation that would let beer wholesalers deliver full-strength beer directly to restaurants or clubs, instead of having to deliver them to the DABC warehouse first. "The public will see no real change: The same beer products in the same containers," said sponsoring Rep. Curt Oda, R-Clearfield. Only the middle-man will be removed. Lee Davidson and Robert Gehrke contributed to this report. The New York Times • "Utah Liquor Laws, as Mixed Up as Some Drinks"
USA Today • "After trying liberalization, Utah toughens already strict rules"
The Economist • "The drinks flow more freely, except in Utah"